In 2017 we spent a lot of time talking about gaming’s so-called “Indiepocalypse.” People cited different contributing factors, but this hypothetical indie game implosion usually came down to some combination of bigger budgets, a more crowded market, and dwindling audience enthusiasm. And you know what? In 2017 it didn’t seem too impossible. Although an indie game (What Remains of Edith Finch) won our 2017 Game of the Year prize, it was one of the few to make the list. And yet in 2018, our ten-game list has nine indie games. Only one big-budget game made the cut. In part that’s because 2018 was a year of high-profile flops, from Far Cry 5 to Fallout 76 and everything in between. But indies showed up in a big way for 2018, putting out creative and emotionally rich experiences that reminded us why the indie scene thrived in the first place. So without further ado, let’s give these games the praise they deserve. As always, our list is in no particular order, with the exception of our first-place Game of the Year pick. The rest are all tied for second place. Stick around afterwards for a few honorable mentions as well—expansions ineligible for our official Game of the Year list but still worth recognizing. Mutant Year Zero ($35 on Humble) sold me with its elevator pitch. It’s like XCOM, see? Except where XCOM rigidly locks the player to its grid at all times, Mutant Year Zero lets you roam its maps in real-time, and then drop into turn-based tactical combat on command. This lets you set up elaborate ambushes, hiding along an enemy’s patrol route and picking him off before he can alert the rest of his crew, then picking off another and another until you’ve sufficiently evened the odds. It’s a fantastic setup, and a brilliant addition to the XCOM-style tactics that Mutant Year Zero otherwise wholesale clones. But it’s the characters and the world that enamored me most. Based on a tabletop RPG, the post-apocalypse of Mutant Year Zero is charming and unique in a way you rarely expect with post-apocalyptic settings these days. Beginning your adventure with a mutated, humanoid pig and duck in your party, you’ve soon gathered a band of misfits who’re funny and deadly competent alike. Even better are the Artifacts, relics from our time described by the people of the future—which explains why a harmless “Boombox” is mistaken for a bomb. Mutant Year Zero has some issues with difficulty spikes, a few extraneous systems, and ends prematurely, but it’s a fantastic adventure nevertheless and only left me wanting more. You’re humanity’s last hope. As an invasion of giant bugs swarms across the planet, three pilots are sent back in time to try and stave off the threat. Using whatever machines you can commandeer, you must turn back the enemy tide and hopefully wipe them out completely—or lose, and start the process all over again. Into the Breach ($15 on Humble) is unforgiving, but unequivocally fair. That’s what makes it so addictive. Playing out on an eight-by-eight grid, it’s a tactics game where you can see your enemy’s next turn ahead of time—and try to counter it. When you pull it off, saving humanity with smart maneuvering, you feel like a genius. When you screw it up and watch bugs wipe out an entire city in one turn, there’s nobody to blame but yourself. It’s fantastic, both a gentle onboarding for tactics newcomers and a satisfying puzzler for the genre diehards. 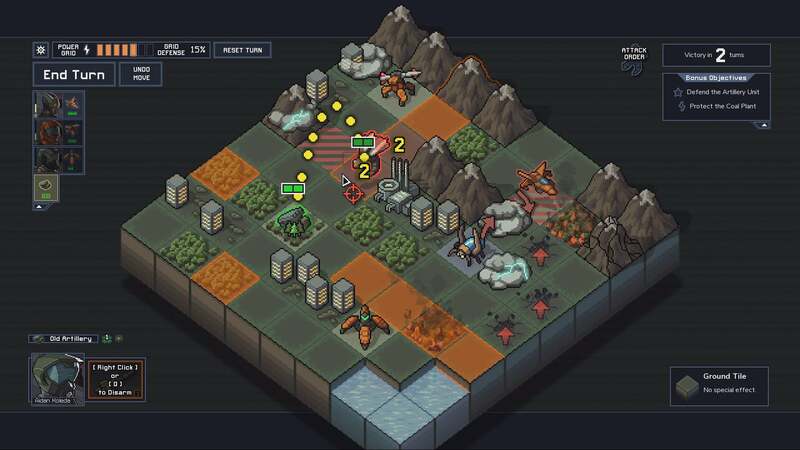 And where XCOM and Mutant Year Zero are both sprawling multi-hour affairs, your average Into the Breach run lasts maybe 30 or 40 minutes—turning the classic Civilization mantra of “One More Turn” into “One More Run,” basically. I’ve lost a lot of hours of sleep trying to save humanity this year. I continue to be amazed by and obsessed with the Cube Escape/Rusty Lake team. What started as a series of free browser-based games has grown more ambitious with every entry, and 2018’s Cube Escape: Paradox is no exception. A three-part experience, Cube Escape: Paradox (free on Steam) begins and ends with the same sort of macabre room-escape puzzlers the series is known for. The first is pretty rote, easing you in with a familiar array of locked boxes, arcane symbols, and scrawled notes. The puzzles are simple, the imagery a bit underwhelming compared to what we’ve seen in past entries like Rusty Lake Paradise. For a minute I was worried. But the surreal second half of Cube Escape: Paradox ($3 on Steam) is excellent, with one of the most creative puzzle sequences they’ve pulled off to date. The story bounces between past, present, and future states of the same room—thus expanding the scope threefold without technically breaking the “room escape” conceit. And then there’s the middle chapter: A 20-minute short film that reproduces the Rusty Lake aesthetic in live-action form. It’s more than a novelty, as well. The film, which you can view for free here, contains secrets that add to the Cube Escape: Paradox story and the overarching Cube Escape/Rusty Lake lore, a rabbit hole that now constitutes something like 15 games. The only question now is how the team can possibly top itself again. In a year filled with so-called “Metroidvanias,” Yoku’s Island Express ($20 on Humble) stands out as the most unique. The premise is familiar as always: You navigate a maze-like, interconnected world that opens up more and more pathways as you acquire new abilities. So far, so Symphony of the Night. That’s the gimmick. In Yoku’s Island, you play as the titular dung beetle Yoku as he drags around (or more often is dragged around by) a rock. You can move Yoku left or right, but can’t jump. Instead you’re at the mercy of pinball flippers, embedded in the ground or attached to the ends of platforms. Bounce off bumpers, ride ramps, collect fruit—Mokumana Island is essentially one enormous and elaborate pinball table, dotted with characters and a fair number of quests as well. Few genre mashups feel as effortless. The story ranges from the mundane (“You’re a postman, so deliver these packages”) to the existential (“Oh and by the way, the world’s ending”), and while there’s a bit too much backtracking involved it’s hard to be annoyed when moving around the island is such a simple joy. Subnautica ($25 on Humble) understands the allure of the unknown. That’s ultimately what lands it on our best-of list. It’s one of the few games to properly balance between guided experience and sandbox, between story and survival. The early hours are pure frantic survivalism. You crash-land on an alien planet, adrift in what seems like a world-encompassing ocean. Like any survival game, your first order of business is collecting enough food and water to live. Soon you start to feel comfortable though, and the ocean feels less foreign. You start to recognize the alien fish on-sight, even stockpiling a healthy supply in case of disaster. You roam further afield, swim out away from your base or maybe a bit deeper under the waves—and then it all starts to look alien again. An entire new ecosystem awaits, this one slightly more threatening, the supplies scarcer, the ocean’s depths darker and more treacherous. And that’s before you even stumble upon the actual secrets hidden beneath Subnautica’s sea. I don’t usually fall in love with survival games, but I sank (heh) a lot of hours into Subnautica. Its trail of story bread crumbs is a model the genre should follow more often, leading players to the coolest bits while still leaving plenty to explore and experiment with. Here it is, the only traditional, big-budget game to make PCWorld’s 2018 Game of the Year list: Hitman 2. It’s easy to diminish Hitman 2 ($60 on Humble) and say “It’s just more Hitman.” That’s true. In a year full of iterative sequels, Hitman 2 is the most iterative. It feels like the “Hitman: Season 2” it was originally intended to be. That reductionist framing undercuts how damn great Hitman 2 is though. The previous iteration stumbled on an ingenious way to blend the sandbox fun of Blood Money with a friendlier, more guided experience. Hitman 2 continues pursuing those ideas while making some of the most complicated and ambitious levels of the entire series. Each is an intricate puzzle box you’re tempted to play and replay, pulling on different loose threads each time and seeing where they might lead. It’s like the world’s funniest game of Clue. One run you’re the security guard, killing your target with a syringe full of poison. The next, you’re a mechanic pouring sugar in her gas tank. The third, you throw your briefcase at her head and walk away dressed as a flamingo mascot. And to this foundation Hitman 2 adds a few more tricks, like hiding in foliage, or allowing the enemy to spot you in mirrors. It’s more Hitman, sure, but it’s also IO’s finest work to-date. Thronebreaker: The Witcher Tales ($30 on Steam) is smaller in scope than the genre-defining RPGs CD Projekt is known for. A spin-off of a spin-off, Thronebreaker essentially wraps a story around The Witcher 3’s card game side-activity, Gwent. What a story, though. Casting the player as Queen Maeve of Lyria, Thronebreaker gives us a window onto The Witcher’s world that isn’t filtered through Geralt and his fellow outcasts. Instead you’re plunged into a world of courtly intrigue, making decisions that will affect the entire realm as Maeve stands against the encroaching Nilfgaardian Empire—and threats considerably closer to home. As per usual, CD Projekt’s writing is remarkably nuanced, with few scenarios resulting in cut-and-dry winners and losers. The Gwent aspect is often just as inspired, though. Standard battles can be a bit dry, but Maeve’s decisions feed directly into the deck-building aspect. Important characters often correspond to cards, and alienating someone in the story might lead to them leaving your party—and your deck as well. For instance, by sparing the Scoi’atel from Maeve’s wrath I directly alienated a party member, and thus also lost her ability to search through my deck for cards to play during battles. Even better are the Puzzle Battles, which reimagine Gwent’s card-based mechanics around unique scenarios, turning the board into a prison break complete with patrolling guards, or a drinking game between a fast-chugging dwarf and a considerably less talented human. It may not be a Witcher or a Cyberpunk, but CD Projekt still did a remarkable job with Thronebreaker.